The monarch population, which is determined by measuring the number of hectares the butterflies occupy in their Mexico habitat, has declined to 2.48 hectares—almost 30 percent less than last year’s population. The population has been in steady decline for the past 20 years—reaching a high of more than 20 hectares in 1997 and plunging to 0.67 hectares in 2014. Two decades ago, nearly one billion wintering monarchs blanketed the mountain forests of Mexico. Today, that number has dropped by more than 80 percent. Heavy use of an herbicide called glyphosate (marketed by Monsanto as Roundup) has greatly diminished milkweed, a native wildflower that is the sole food source for monarch caterpillars and the only plant on which adult monarchs lay their eggs. As milkweed disappears, monarch populations have also plummeted, and the annual migration of monarchs to Mexico is in danger of collapse. And yet the U.S. Environmental Protection Agency (EPA) recently reapproved the registration for Dow’s Enlist Duo, a combination herbicide designed to kill milkweed. Much effort has gone into planting milkweed throughout the continental U.S. in the past several years in an attempt to make up for the milkweed that has been lost through agricultural practices. Planting milkweed is a great way to help other pollinators, too, as it provides nectar to a diverse suite of bees and butterflies. But this year’s monarch butterfly population demonstrates that we need to do much, much more if we are going to be successful at building its population back up again to secure numbers. We also need to curb the use of pesticides that are eliminating milkweed in the first place and come up with sustainable solutions—not just for butterflies, but for farmers and our public health. 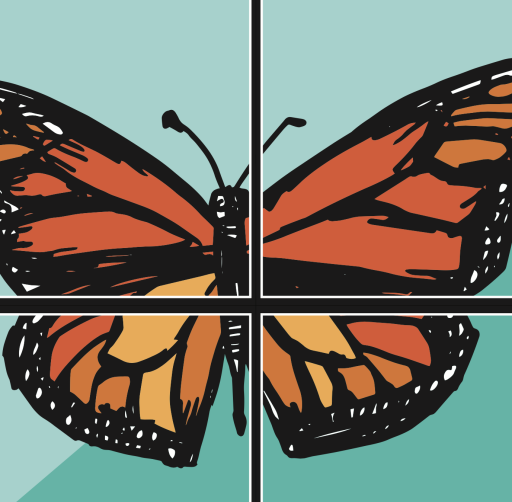 NRDC envisions a future where monarch populations across North America are healthy and resilient. To achieve this, we’re working at the federal, state, and international levels to secure limits on the use of toxic herbicides and create new milkweed habitat. We’re taking legal action against against the EPA to win restrictions on toxic herbicides, such as glyphosate, that are killing off native milkweed. And we’re calling on agribusiness companies to withdraw their toxic products. At the state level, we’re working with officials to plant new milkweed habitat along the monarchs’ migration route. Internationally, we’re leveraging pressure by petitioning UNESCO’s World Heritage Committee to upgrade its protection of monarch wintering habitat in Mexico. We mobilized more than 113,000 of our members and activists to sign a petition demanding Dow AgroSciences remove Enlist Duo from the market. Not only that, we generated an outcry against Enlist Duo in Congress that included signatures from 32 lawmakers calling on the EPA to take a closer look at the devastating health and environmental impacts of this herbicide. On the global arena, we ramped up international pressure, including 50,000 petitions from NRDC members and activists, on the UNESCO World Heritage Committee to declare the Monarch Butterfly Biosphere Reserve in Mexico in danger due to the destruction of monarch habitat in the U.S. and Canada by glyphosate. In response, UNESCO launched a formal evaluation of the request. Monarch Watch is a nonprofit educational outreach program based at the University of Kansas that focuses on the monarch butterfly, its habitat, and its spectacular fall migration. NRDC partners with Monarch Watch to plant milkweed at schools, churches and garden clubs to help save North American monarch butterflies. 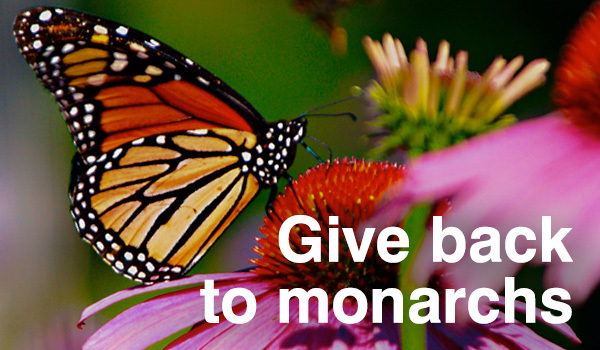 Since 2016, Monarch Watch has been distributing milkweed plants, featured in this Monarchs for Moms campaign, for planting on tribal lands and other locations along the monarchs’ migration route. By Center for Food Safety. The yearly count of monarch butterflies overwintering in Mexico, released Monday, shows a decrease from last year’s count and confirms the iconic orange and black butterfly is still very much at risk. The count of 2.48 hectares of occupied winter habitat is down from 2.91 hectares last winter. “We could lose the monarch butterfly if we don’t take immediate action to rein-in pesticide use and curb global climate change,” said Tierra Curry, a senior scientist at the Center for Biological Diversity and co-author of the 2014 petition to protect monarchs under the ESA. Roughly 99 percent of all North American monarchs migrate each winter to oyamel fir forests on 12 mountaintops in central Mexico. Scientists estimate the population size by measuring the area of trees turned orange by the clustering butterflies. That population has been dangerously low since 2008. In the mid-1990s the population was estimated at nearly one billion butterflies, but this year’s population is down to approximately 93 million butterflies. This year’s drop is attributed in part to unseasonal weather last year including late spring freezes that killed milkweed and caterpillars, and an unseasonably warm fall that kept late-season monarchs from migrating. In 2014 conservationists led by the Center for Biological Diversity and the Center for Food Safety petitioned the U.S. Fish and Wildlife Service (USFWS) to protect the butterfly under the Endangered Species Act. Monarchs are threatened by a host of sources destroying their habitat and food, but studies have shown that a main source of their catastrophic demise decline has been genetically engineered crops, engineered with resistance to Monsanto’s Roundup pesticide, which has dramatically increased the pesticide use on their habitat. The Fish and Wildlife Service’s initial decision was that endangered species protection may be warranted, and pursuant to a court victory the USFWS agreed to make a final decision by June 2019. A 2016 study by the U.S. Geological Survey concluded that due to ongoing low population levels, there is between an 11 percent and 57 percent risk that the eastern monarch migration could collapse within the next 20 years. Scientists estimate the monarch population needs to reach 225 million butterflies to be out of the danger zone. Monarchs have lost an estimated 165 million acres of breeding habitat in the U.S. to herbicide spraying and development. The caterpillars only eat milkweed, but the plant has been devastated by increased herbicide spraying in conjunction with corn and soybean crops that have been genetically engineered to tolerate direct spraying with herbicides. In addition to glyphosate, monarchs are threatened by other herbicides including dicamba, Enlist Duo and by neonicotinoid insecticides that are toxic to young caterpillars. Monarch butterflies west of the Rocky Mountains overwinter on the central coast of California. Their numbers dropped to a five-year low of only 200,000 butterflies this year, down from 1.2 million two decades ago. A recent study found that if current trends continue, the western population has a 63 percent chance of extinction in 20 years and more than an 80 percent chance of extinction within 50 years. Reposted with permission from our media associate Center for Food Safety.